The first part of my Chilean adventure saw me FINALLY arrive in Santiago over 24 hours later than originally planned but still in time for the start of my training. I arrived Sunday morning to this strange new city, but weirdly, it felt kinda normal. After the nightmare of trying to leave the UK, it felt great to finally be in Chile! The only downside is that it was very empty, but I put that down to it being Sunday and I was completely right! Back at the hotel in the evening we went for food and met more of the volunteers there. 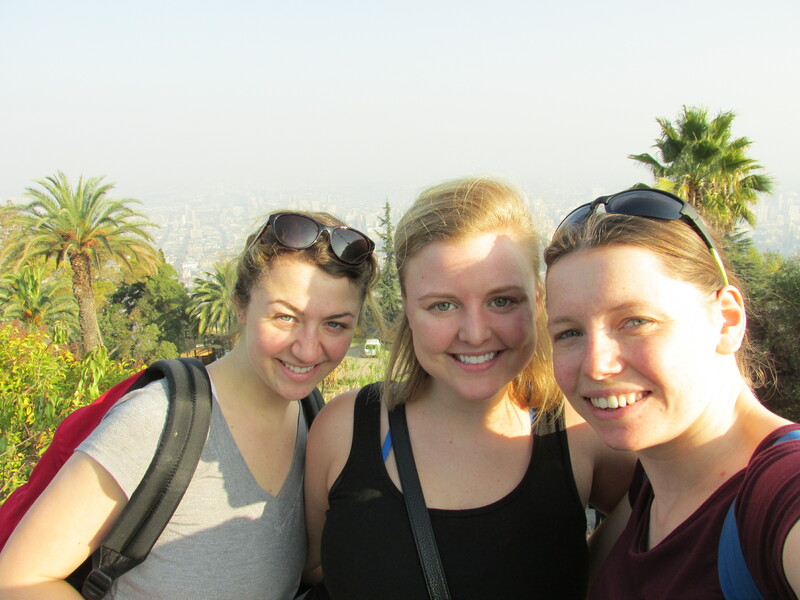 We all received our training together in Santiago before jetting (or busing!) off to our new homes all across Chile. It’s mostly Americans with some Brits and one or two from other corners of the world (Australia, New Zealand, India, Hong Kong, Philippines, Lithuania, Russia & Canada). Monday to Thursday saw us through our intense orientation to the programme and TEFL training, with everyone teaching a “micro” class by the end of it. For someone like me who’s never done any English language teaching, that’s quite a big jump in just 4 days! All of our classes with the Chilean students have to be 100% in English, but most of the students have a very basic understanding and generally reply in Spanish. The last day was a bit more relaxed, with presentations from former volunteers in the programme about their experiences, and a little heads up about some Chilean culture which we may or may not encounter. The general gist is that Chileans are very relaxed with regards to time (but we can’t use it as an excuse for being late), they’re really friendly, it’s pretty cold even inside due to no central heating and parties start very late at night! Despite training all day I still managed to get out in the evenings and see some of Santiago. I also had the weekend to explore as my flight down south to Punta Arenas wasn’t until Monday morning. One night I tried some salsa at a local bar where I learnt the word cadera as the instructor was making sure everyone was moving those hips!! Another night we went out with some Chilean people who were very surprised that we were going home at 1:30am… the night was only just getting started! 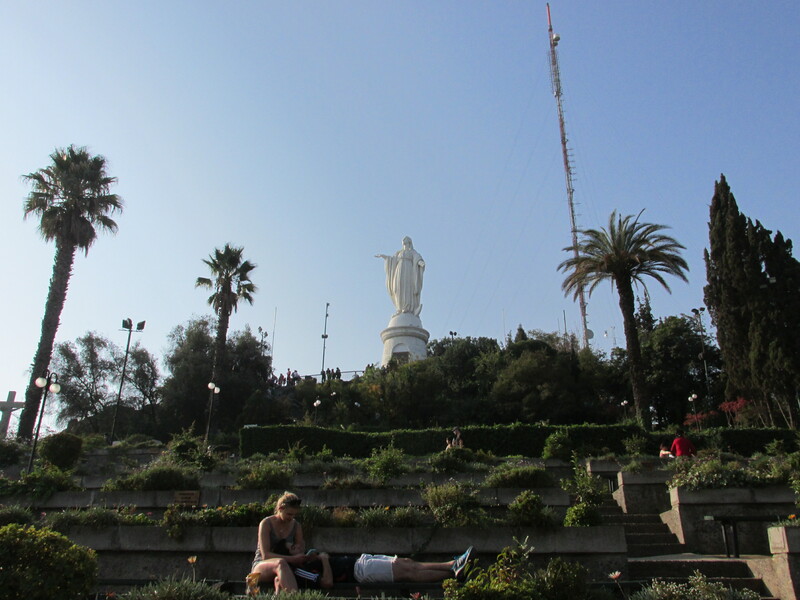 The weekend meant I could finally have a lie in but I only had these few days to explore Santiago. 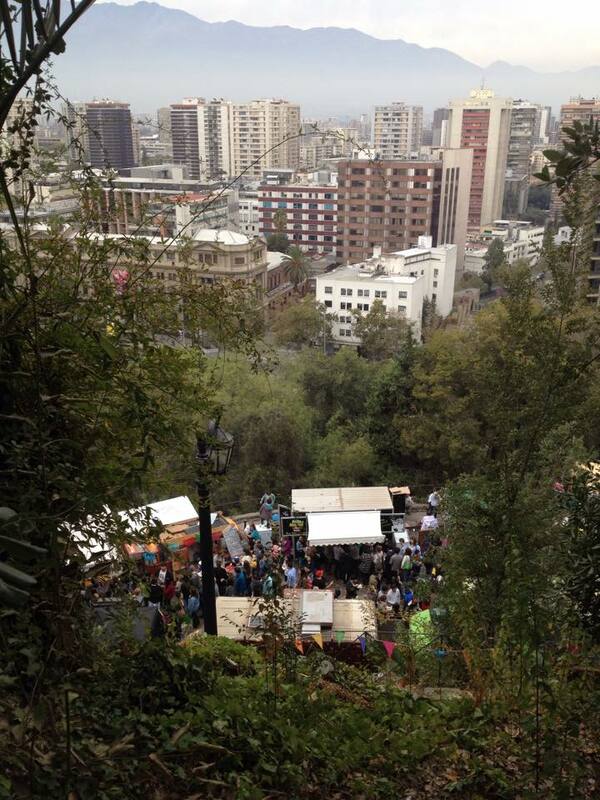 On Saturday I walked up to the statue of San Cristobal, one of the few green spaces that’s in the city. 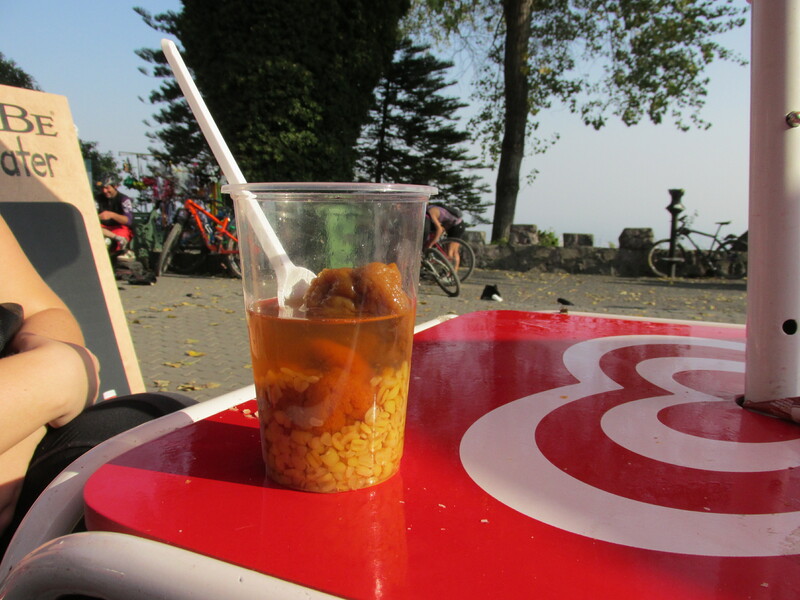 It was a hot day but also so good to do something active! The only exercise I’d had all week was opting to walk up the stairs instead of taking the lift up to the 6th floor every day, where we then sat down for hours on end. 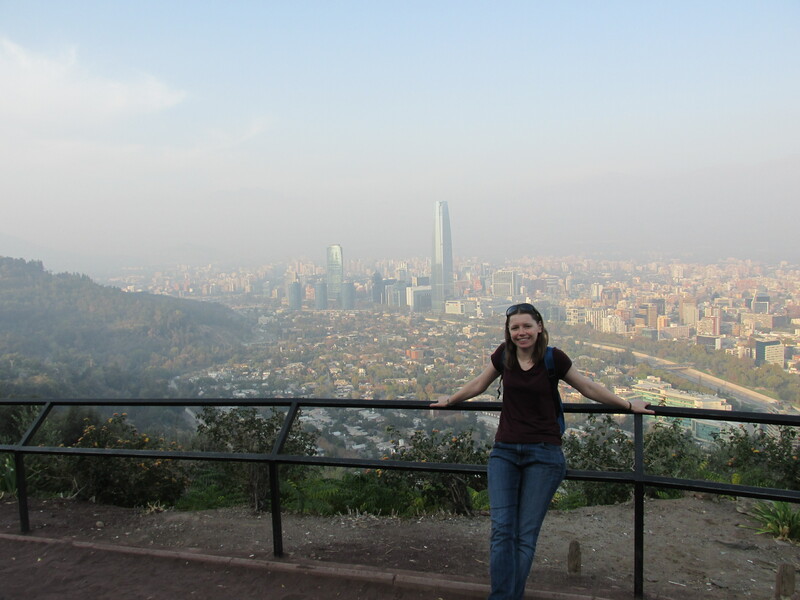 The view of Santiago was absolutely great yet it could have been ten times better. So sad to know there’s mountains backing the city, but there’s so much smog you just can’t see them. The city is huge and you can’t even see the edge of it from the top of the hill. Was very glad I’d be heading further south with better air and more mountains around me. Sunday meant a trip to one of Santiago’s many museums – the Museum of Human Rights. A fascinating yet tragic look at part of Chile’s history. Although there was an audio tour in English, I’d like to go back when my Spanish is better and with more background information first – it was a lot to take in without too much previous knowledge and all the displays in Spanish. We bumped in to other volunteers at the museum, and once we were all done we headed to the nearby park. After a heavy dose of horrible facts, we needed some childish relief, which meant eating a completo (hot dog with avocado, mayo, tomato and whatever else you want! ), enjoying the sunshine and running through fountains. I had to make the most of the sunshine before heading to the end of the world for another winter! I love visiting cities for short bursts (like the trip to London for my visa) but I’m too much of a nature loving person to stay there too long. Now is the time of year where my bushcraft job is starting, and I am rather jealous of my friends who are snuggling in to their forest beds and running around with their “tribes” of children on summer camps. I have to agree with your comment about not wanting to live in a big city. While I’ve never been to Santiago (or anywhere in South America sadly), I find big cities exciting and full of things to do, but the pollution and traffic makes one long for the countryside before too long! The best trips are a mix between cities and small towns/countryside I reckon. Need some nature to recharge in! Hope you have a great time in Chile. I always wondered how people taught 100% English classes – i.e. without speaking the native tongue. Obviously the students must know the basics, but it seems like it would be difficult to explain new words etc.